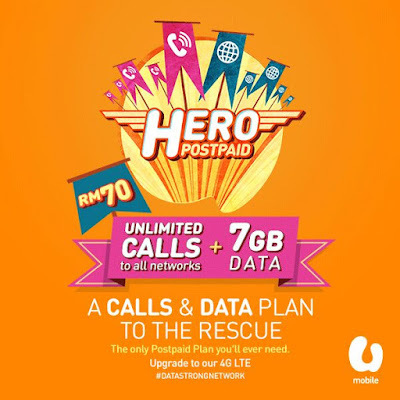 U Mobile HERO plan, the new postpaid plan from U Mobile was launched recently. What’s most interesting about this plan is the unlimited free calls and the flat low price of RM70/month, including 7GB of Internet data. There no contract and the voice calls are truly unlimited. 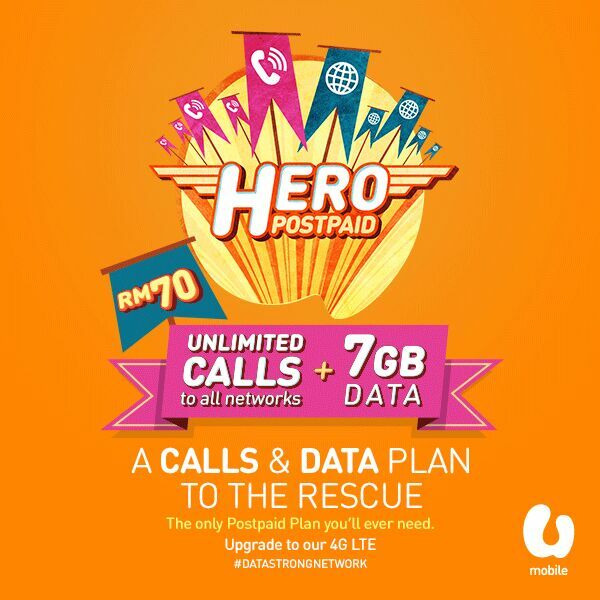 Our sources told us that all current U Mobile P70 postpaid plan users will be upgraded to the HERO plan automatically. The other two U Mobile postpaid plans, U28 and P50 will remain with extra Internet. U Mobile won’t be offering Unlimited SMS for the Hero plan. Our source said that the 7GB Internet data is more than enough for using messaging apps such as Whatsapp, WeChat, KakaoTalk, Viber, etc. Customers can walk in to U Mobile service centre and sign up for the U Mobile HERO plan starting 1st September 2015. More details please refer to U Mobile. Compare with MaxisONE. MaxisONE plans were only revamped about 2 weeks ago. The cheapest MaxisONE plan starts at RM98/month with only 1GB Internet. We believe U Mobile is responding to Maxis with the launch of HERO plan. The U Mobile HERO plan offers more value for money. Not only it is 2 times more cheaper than MaxisONE plan 188, it has a faster 3G network too. U Mobile is a new Telco, about 7 years old and it is still improving network coverage in Malaysia. Its 3G network works best in KL, Negeri Sembilan and other states such as Johor, Penang and in Perak. Apart from these areas, U Mobile has 3G RAN sharing network agreement with Maxis in selected towns in West Coast Malaysia, East Coast (Kuantan, Kota Bahru and Kuala Terrengannu) and major towns in East Malaysia (Sabah & Sarawak). The “Orange” operator is deploying 1,000 new 3G sites and 1,000 new 4G LTE sites this year. In general, Malaysians spend an average RM80-RM100 every month on postpaid plans. As of Quarter 2 this year, the average revenue per user for postpaid are: Digi (RM82), Maxis (RM97, for MaxisONE plan its RM150) and Celcom (RM90). U Mobile has a smaller base of postpaid users (likely due to its smaller coverage areas and perhaps it isn’t spending as much as the big boys when it comes to marketing), but we think that they now have the most attractive postpaid plan, flat at RM70/month (Hero plan).